This chapter flocks together from October through April. August in southern Arizona can be fabulous, but hot. So, Southern Arizona chapter members head north to stay cool. The chapter rally schedule runs from October through April, with the highest attendance at the January, February, and March gatherings, Wade said. “That’s when the snowbirds are all here; some don't come until after the holidays." And rally they do. Most chapter rallies take advantage of southern Arizona's many attractions. "There's a lot of history in Bisbee, Douglas, Tombstone . . . all great towns to go sight-seeing and souvenir-hunting," Wade said. "If we're in the Benson area, folks go down to Kartchner Caverns. And we did a tour of Shamrock Farms dairy in Maricopa the last couple of years; that is always a pleasure." 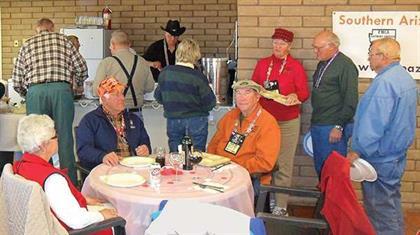 Aside from touring area sites, chapter members usually have one potluck meal and a couple of dinners out per rally. And they play games. One particular card game called Chase the Ace gets everyone "whooping and hollering," Wade said. The chapter also has an altruistic bent that shows itself each winter. "Tucson is high enough in elevation — it gets pretty cold," Wade said. Kathy Nelson, a chapter member who has since passed away, began a tradition of creating warm items for the needy. "We have continued it in her memory," Wade said. "Last year we donated 90-some hats and scarves and gloves." The ladies of the chapter usually get together during a rally to crochet or knit and share patterns to create the beautiful items. The chapter has been around since 1982, and Wade said they are already planning their 30th anniversary rally for November 2012. Through the years, the number of chapter members has varied; it was down to around 30 a few years ago, and now it's approximately 50. Wade credited FMCA's "Dozen Does It" program with helping them add to their roster in the past few years, but they're still looking for more members to join in the fun. Dues are only $10 per coach, with a $5 initiation fee.